Also many a times, patients present with fracture neck of femur 2 weeks after the occurrence because of initial management by local bone setters. Just because of negligence or unassessment of severity, they present delay when the golden hour is already lost. Differences exist between young adults and older patients on the treatment of femoral neck fractures. According to the literature, closed reduction with internal fixation (CRIF) is the best treatment method as it is effective, less invasive, and requires less operation time. Treatment and fear of complications in patients with delayed femoral fractures are important concerns of orthopedic surgeons. Sandhu et al. have proposed a radiological classification for this injury based on the following variables: (1) fracture site (irregular or smooth), (2) size of proximal fragment (>2.5 or <2.5cm), (3) gap between fragments (<1cm, 1–2.5cm, or >2.5cm), and (4) signs of AVN. This classification involves an MRI for determination. It has not been validated and does not alter management. Scintigraphy may have a role in early postoperative evaluation of AVN before plain radiographic features are identified. Bone scans performed within 2 weeks of operation following 306 non-neglected hip fractures have been shown to determine the healing course with an accuracy of 91% (into categories of uneventful healing, hardware failure, nonunion, and AVN). Broeng et al. showed that decreased uptake noted on a bone scan 1–3 weeks postoperatively and 2 months postoperatively was indicative of eventual loss of reduction or segmental collapse in 50% of patients, whereas normal or increased uptake at those times correlated with uncomplicated healing in 90% of patients. Viberg et al. conducted a study and published that low bone bone mineral density (BMD) may be a factor in internal fixation failure. Although not statistically significant, the subgroup analysis for undisplaced fractures showed a hazard ratio of 6 for low BMD as compared to 0.8 for the whole group. We searched in MEDLINE database about the management of delayed presentation of fracture neck of femur and reviewed many articles. No single clear-cut schematic, diagrammatic guideline for this unsolved fracture is available. “The neglected femoral neck fracture in young adults: review of a challenging problem” by Roshan and Ram and another review by Jain et al. were useful [Table 3] and [Table 4], [Figure 1], [Figure 2], [Figure 3]. Fracture neck of femur remains an unsolved fracture from the beginning of orthopedics, even today with advanced tools and infrastructures because of its peculiar anatomy. Not a single definite method of treatment is available. It varies from person to person, age to age, status of head and neck, and depends on patient’s requirement. Sometimes Mcmurray osteotomy also helps the patient to live a life with full weight-bearing with his ability to sit cross-legged on floor, though it produces a bit shortening. Therefore, each case is to be dealt as a different case considering its history, geography, status, and requirement of the patient. Swiontkowski MF, Winquist RA, Hansen ST Jr. Fractures of the femoral neck in patients between the ages of twelve and forty-nine years. J Bone Joint Surg Am 1984;1:837-46. Hou SM, Hang YS, Liu TK. 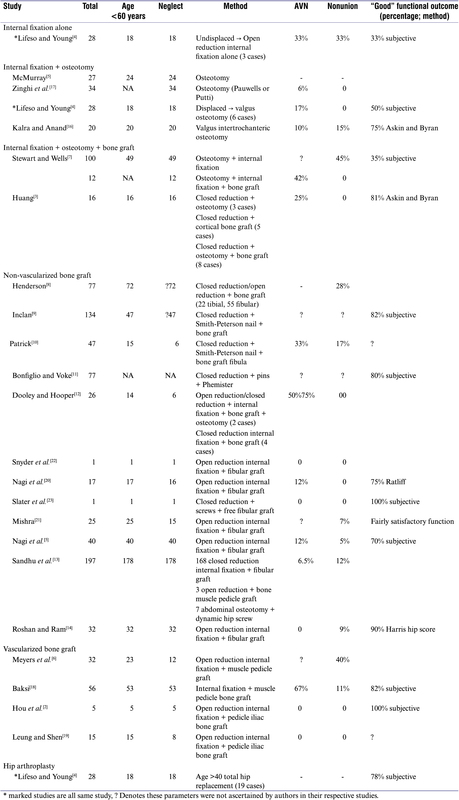 Ununited femoral neck fractures by open reduction and vascularized iliac bone graft. Clin Orthop Relat Res 1993;1:176-80. Lifeso R, Younge D. The neglected hip fracture. J Orthop Trauma 1990;1:287-92. Nagi ON, Dhillon MS, Goni VG. Open reduction, internal fixation and fibular autografting for neglected fracture of the femoral neck. J Bone Joint Surg Br 1998;1:798-804. Meyers MH, Harvey JP Jr, Moore TM. Treatment of displaced subcapital and transcervical fractures of the femoral neck by muscle-pedicle-bone graft and internal fixation. A preliminary report on one hundred and fifty cases. J Bone Joint Surg Am 1973;1:257-74. Stewart MJ, Wells RE. 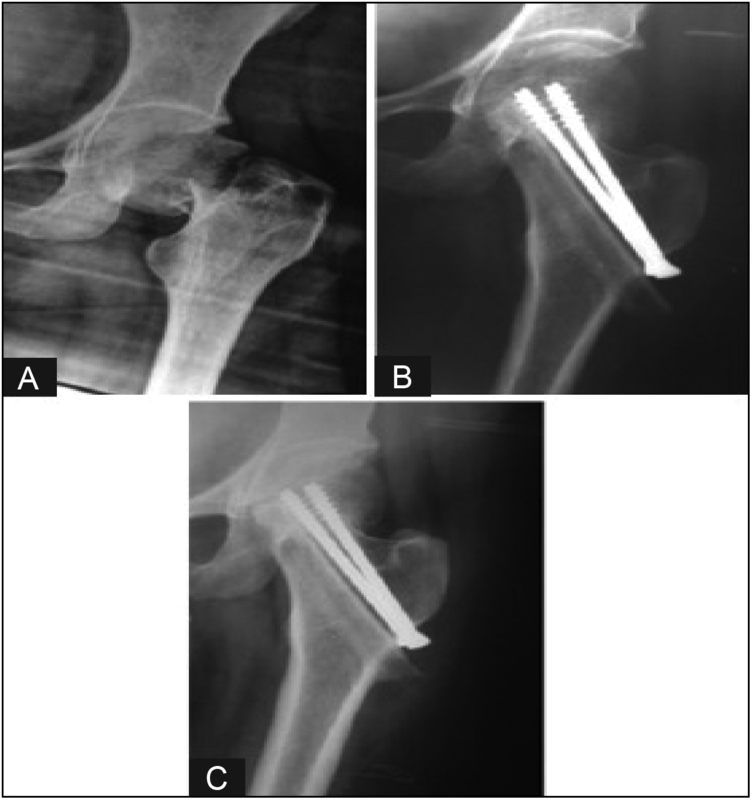 Osteotomy and osteotomy combined with bone-grafting for non-union following fracture of the femoral neck. J Bone Joint Surg Am 1956;1:33-48; discussion, 48-9. Henderson MS. Ununited fractures of the neck of the femur treated by aid of the bone graft. J Bone Joint Surg 1940;1:97-106. Inclan A. Late complications in fracture of the neck of the femur treated by nailing, bone grafting or both. J Int Coll Surg 1946;1:36-50. Patrick J. Intracapsular fractures of the femur treated with a combined Smith-Petersen nail and fibular graft. J Bone Joint Surg Am 1949;1:67-80. Bonfiglio M, Voke EM. Aseptic necrosis of the femoral head and non-union of the femoral neck: Effect of treatment by drilling and bone graft (Phemister technique). J Bone Joint Surg 1968;1:48-66. Dooley BJ, Hooper J. Fibular bone grafting for non union of fracture of the neck of the femur. Aust N Z J Surg 1982;1:134-40. Sandhu HS, Sandhu PS, Kapoor A. Neglected fractured neck of the femur: A predictive classification and treatment by osteosynthesis. Clin Orthop Relat Res 2005;1:14-20. Roshan A, Ram S. Early return to function in young adults with neglected femoral neck fractures. Clin Orthop Relat Res 2006;1:152-7. McMurray TP. Ununited fractures of the neck of the femur. J Bone Joint Surg 1936;1:319-27. Kalra M, Anand S. Valgus intertrochanteric osteotomy for neglected femoral neck fractures in young adults. Int Orthop 2001;1:363-6. Zinghi GF, Specchia L, Ruggieri N, Galli G. The role of osteotomy in the treatment of pseudarthrosis of the neck of the femur in younger patients. Ital J Orthop Traumatol 1985;1:341-8. Baksi DP. Internal fixation of ununited femoral neck fractures combined with muscle-pedicle bone grafting. J Bone Joint Surg Br 1986;1:239-45. Leung PC, Shen WY. Fracture of the femoral neck in younger adults. A new method of treatment for delayed and nonunions. Clin Orthop Relat Res 1993;(295):156-60. Nagi ON, Dhillon MS, Gill SS. 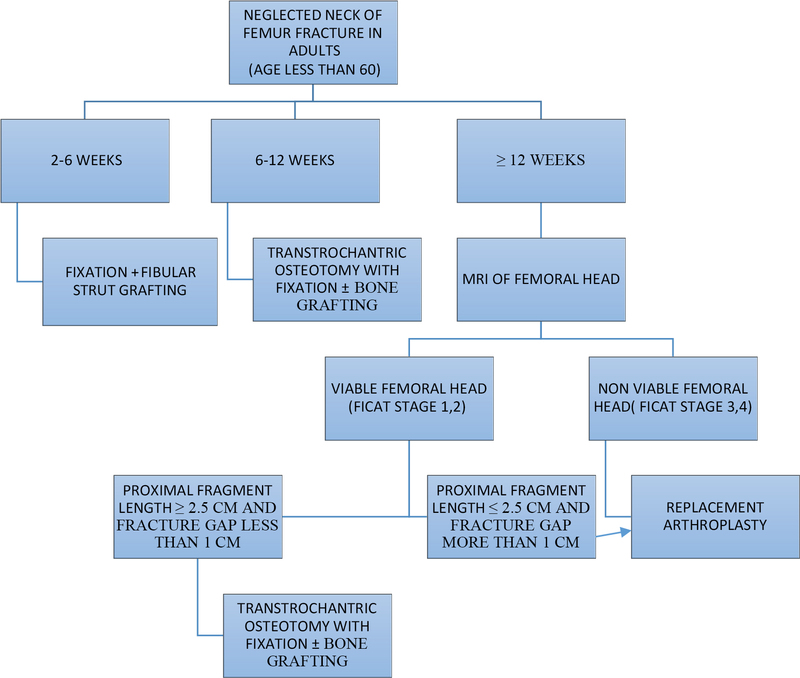 Fibular osteosynthesis for delayed type II and type III femoral neck fractures in children. J Orthop Trauma 1992;1:306-13. Mishra D. Femoral neck fracture open reduction Asnis screw fixation and fibular grafting. Ind J Orthop 1998;1:32-35. Snyder SJ, Sherman OH, Hattendorf K. Nine-year functional nonunion of a femoral neck stress fracture: Treatment with internal fixation and fibular graft. A case report. Orthopedics 1986;1:1553-7. Slater RN, Gore R, Slater GJ. Free fibular bone grafting for femoral neck fractures: Precise graft placement using a ‘cannulated screw’ technique. J R Coll Surg Edinb 1993;1:376-7. Broeng L, Bergholdt-Hansen L, Sperling K. Predicting results of rehabilitation after hip fracture. A ten-year follow-up study. Clin Orthop Relat Res 1993;1:76. Viberg B, Ryg J, Overgaard S, Lauritsen J, Ovesen O. Low bone mineral density is not related to failure in femoral neck fracture patients treated with internal fixation. Acta Orthop 2014;1:60-5. Leighton RK. Fractures of the neck of femur. In: Bucholz RW, Heckman JD, Court-Brown C, editors. Rockwood and Green’s fractures in adults. 6th ed. Vol. 2. Philadelphia, PA: Lippincott Williams and Wilkins; 2006: 1753-91. Jain AK, Mukunth R, Srivastava A. Treatment of neglected femoral neck fracture. Indian J Orthop 2015;1:17-27.